With hubby deployed, I need to be as efficient with time as possible. Spending an hour making a beautiful homemade dinner isn’t an option for me most nights… at least not unless I want a one year old screaming and crying at the kitchen gate for 45 of those minutes. But feeding my kids healthy, well rounded meals is important to me. Enter the life saving freezer meal! With very little extra prep time, I can add meals to my freezer that just need to be pulled out and cooked. So here’s the start to a whole series of freezer friendly meals, and darn, this is a yummy one! 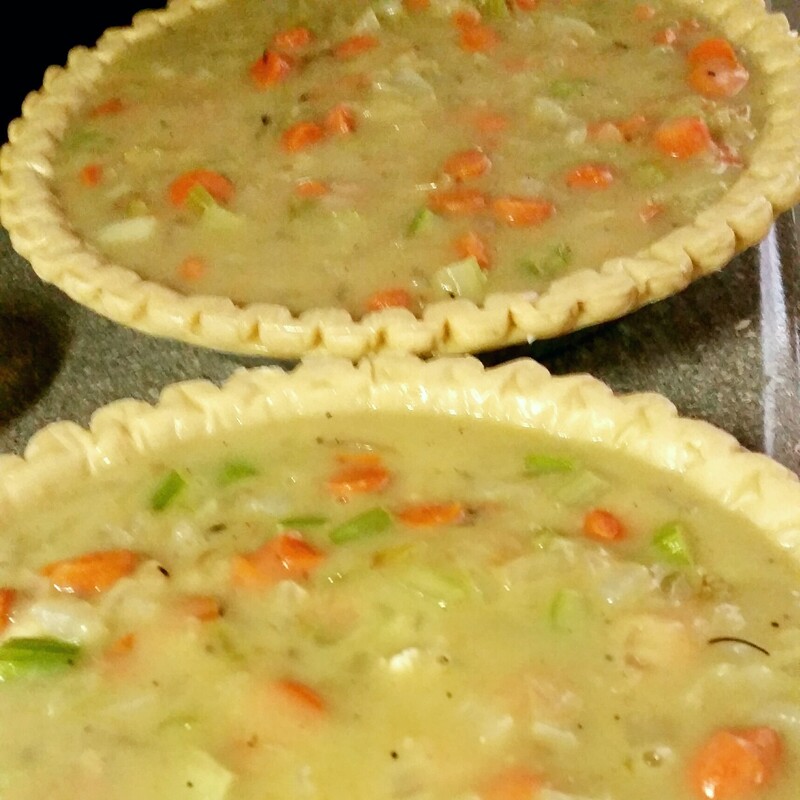 This recipe makes 2 delicious Chicken Pot Pies. That means you can have one for dinner and one for the freezer, both for the freezer, or do a double batch (like me) and really stock up! My favorite part of this recipe is it doesn’t leave you with any odds and ends. It uses a whole onion, both crusts from the packet, a whole carton of chicken broth etc. I’m really terrible at using up those leftover bits and pieces, so I try to avoid that in my recipes if possible. My culinary dirty little secret- I buy my pie crust. 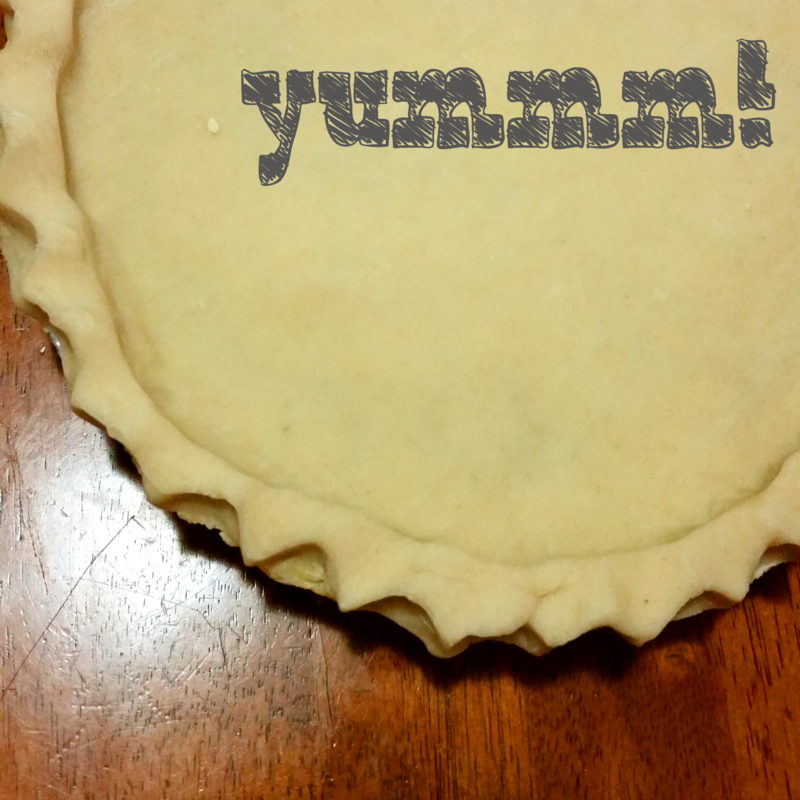 Can I make delicious, flaky, buttery pie crust? Yes. Is it significantly better then the store bought? Nope. Especially not for how labor intensive it is. Pie crust is one of the few things that I don’t think are better homemade. As former pastry chef, I’m pretty sure this is a cardinal sin. Shhhh… don’t tell! The bottom crusts are found in the freezer section. They’re all nicely fitted into the tinfoil pan (which also means you don’t have to wash the pan after enjoying your quick freezer meal!). The top crusts are found in the refrigerated section- often by the premade biscuits and cookies and such. These make this recipe a cinch! Fill a big pot with salted, boiling water. Add chicken and simmer until cooked through. Sautee the onions in butter until they become translucent. Add carrots, saute 1 or 2 minutes. Sprinkle flour over the veggies and stir. Sautee 5 minutes or so (you really want to cook out that raw flour taste, trust me, you’ll thank me!). Add stock and simmer until thick. Dice up the chicken and divide between the two crusts. Divide the bag of peas between the two crusts. Pour filling into the crusts (make sure you get a good amount of veggies in each). Add top crust. Roll over and press the edges into the edge of the bottom crust to get a good seal. Wrap well in tinfoil, label and put it in your chest freezer! Easy as chicken pot pie! To bake, pull out of the freezer a few hours (or the morning) before you want to cook and put in the fridge. Preheat to 375 degrees and bake for 30-45 minutes. You can also bake directly from frozen, just be prepared to cook it a little longer. If you’re baking it right after making it (because come on, who wants to wait to eat delicious pot pie?!?) Preheat to 400 and bake 30 minutes.